When I was growing up, my family visited Amish friends once a month or so. These days, my Dad spends more time than ever with his Amish brethren. 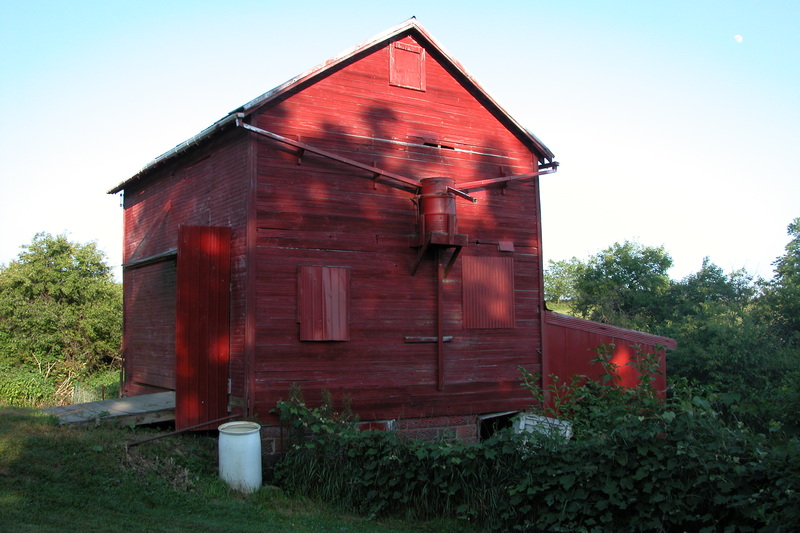 The Organic Valley vegetable co-op is full of Amish families, so Dad has lots of business meetings in Amish kitchens and backyards. He has always loved the simplicity and order of the Amish lifestyle, and in fact when he picked me up on my visit home last month we made a pit stop to watch a family with 16 children (at least) packaging asparagus in bare feet on a cold June afternoon. I loved visiting our Amish friends and climbing the haymow, riding horses and galloping through the pasture, trying to ride cows now and then. I have no idea how close the nearest Amish settlements are here in Pennsylania, but we are lucky in that we do have very good friends on a farm an hour and a half outside of Pittsburgh. 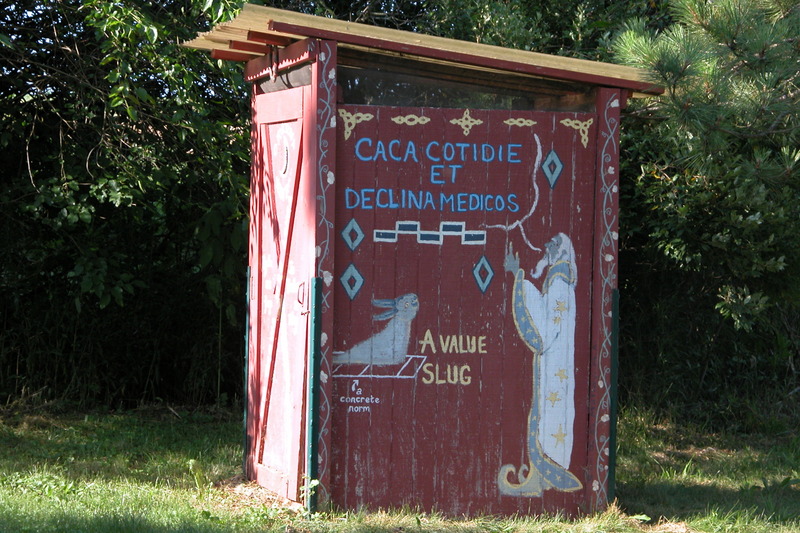 Although they are not Amish, they do have a beautiful (and very erudite) outhouse. I met my friend Rebecca long ago at Ave Maria College in Michigan. It was her first teaching job out of grad school. The first day I met her she was dressed in chic impeccable black with sleek short bottle blond hair. She held out a hand with manicured blood red nails and announced that she understood my desire to be a farmer and a philosopher. I secretly scoffed, having trouble imagining anyone so sophisticated and manicured being a real farmer. I was wrong. It turned out she grew up with back to the lander parents like mine, with similar interludes without running water. 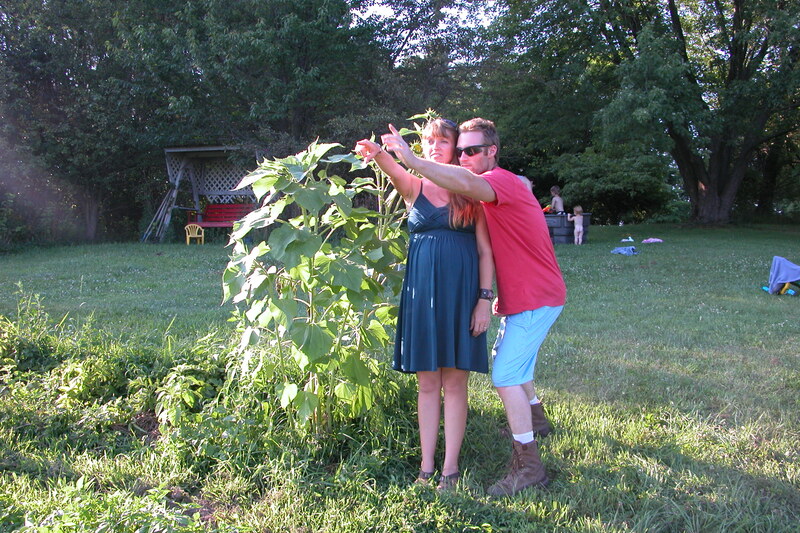 Today, Rebecca teaches Literature and Philosophy at the University of Steubenville and runs a full scale organic farm on her parent’s land along with her husband Brendan and her two (and a half!) children. Here they are, contemplating their bright future. Ha. 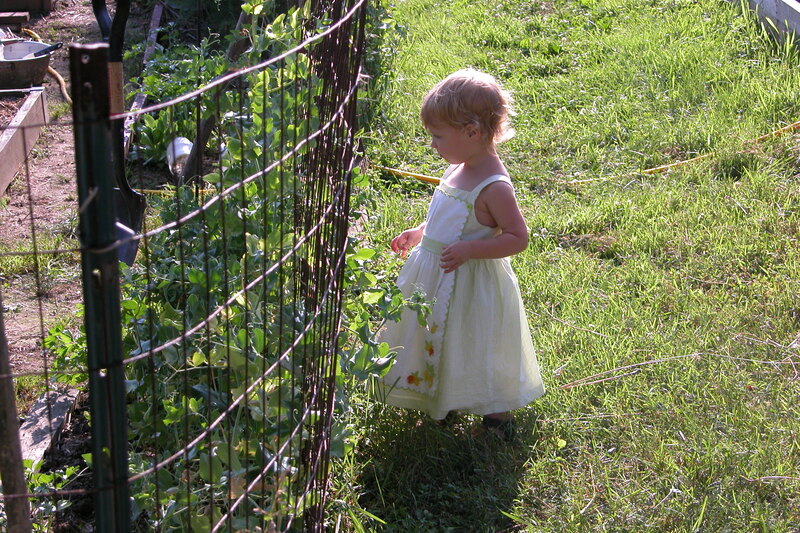 Luckily for me, her parent’s farm is only an hour and a half from Pittsburgh- perfect for a Sunday afternoon visit. 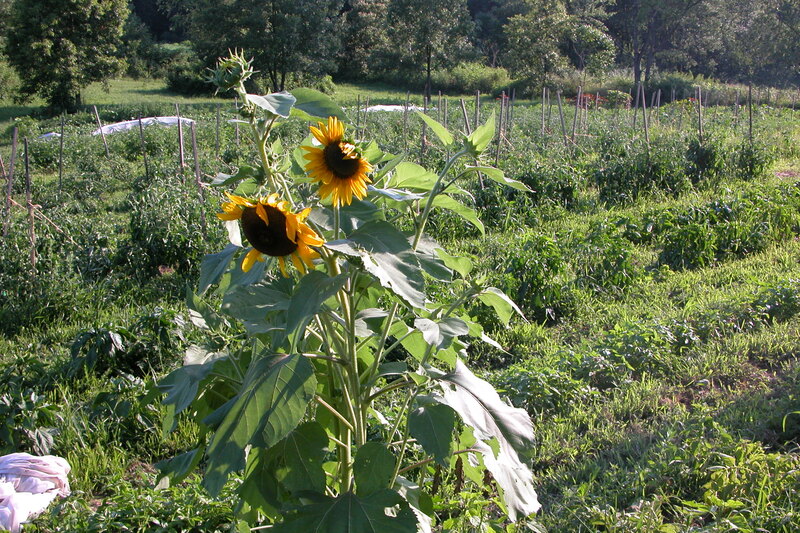 This past Sunday was hot and humid and beautiful- a gorgeous day to be out on the farm. 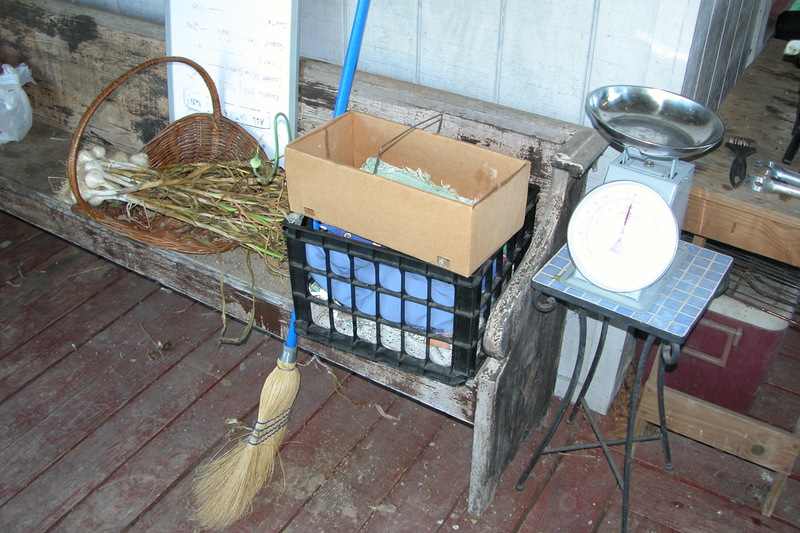 The front porch is very reminiscent of the Slattery farm- broom, garlic, scales, beat up boards and all. If the garlic looks familiar, it is in fact originally Pat Slattery garlic from my Dad. 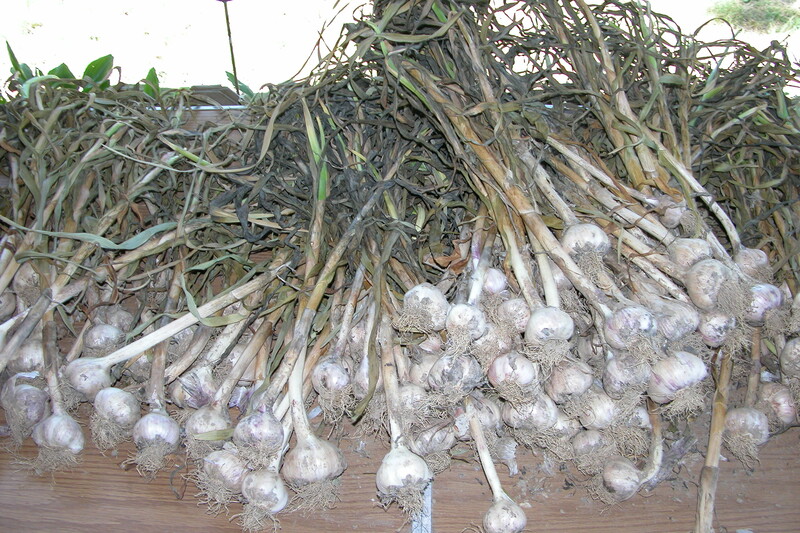 He has been cultivating a variety for years that is huge and flavorful at the same time. Amazing stuff. Rebecca had lots of it drying on the porch. She and Brendan have done incredible work farming together. 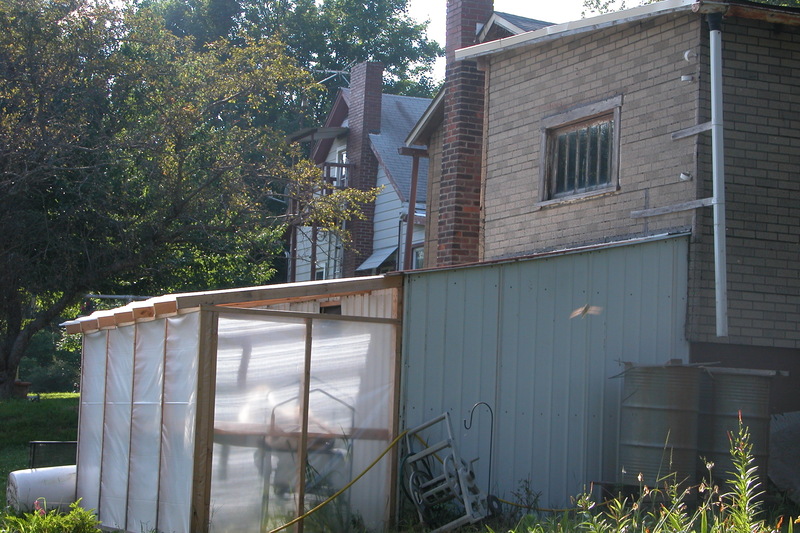 This year they built a greenhouse, which allowed them to expand their growing season and production. They also have really beautiful children. I love this shot of Avila, looking like a little farmer princess. We brought a drum full of castanets, tambourine, rattles, and a plastic trumpet as a present for the kids, who loved it. I figure they can use it in out at the farm and then when the winter comes Rebecca can hide the noisemakers so she doesn’t go insane. It was a lovely afternoon. 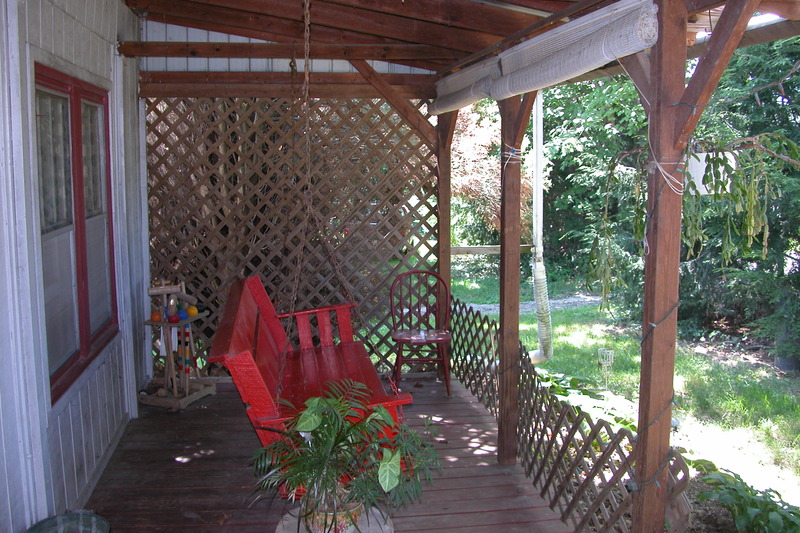 We had beer and brats on the cool shaded porch. In fact, a super secret family recipe for Sheboygan beer brats is coming to this blog soon. I was able to document my 92 year old Grandmother making a batch during my Wisconsin visit this summer. During our Sunday visit I tried the recipe myself for the first time. After the beer and the brats and all the fresh organic produce we could eat, we headed down to the field where Brendan and Rebecca have set up a stock tank swimming pool for the kids. 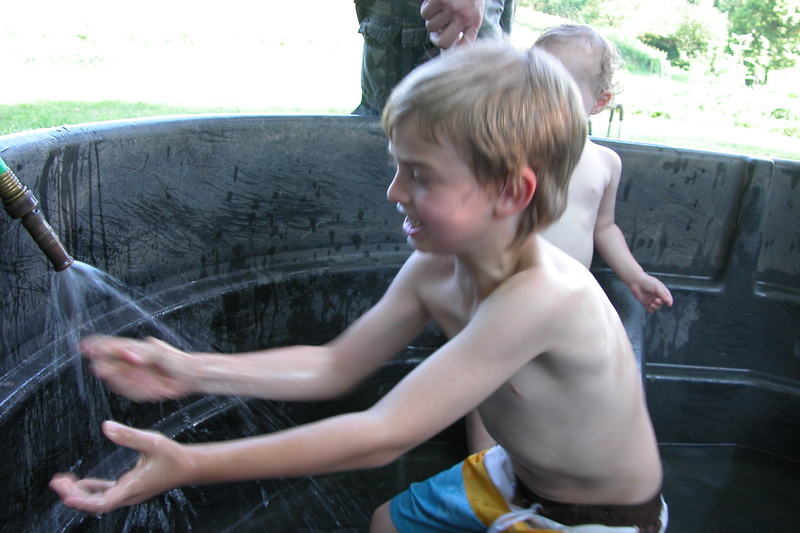 The cold water was perfect on a hot day. We left in the twilight and drove the long hour and a half back towards town. It was a beautiful Sunday afternoon to spend visiting. 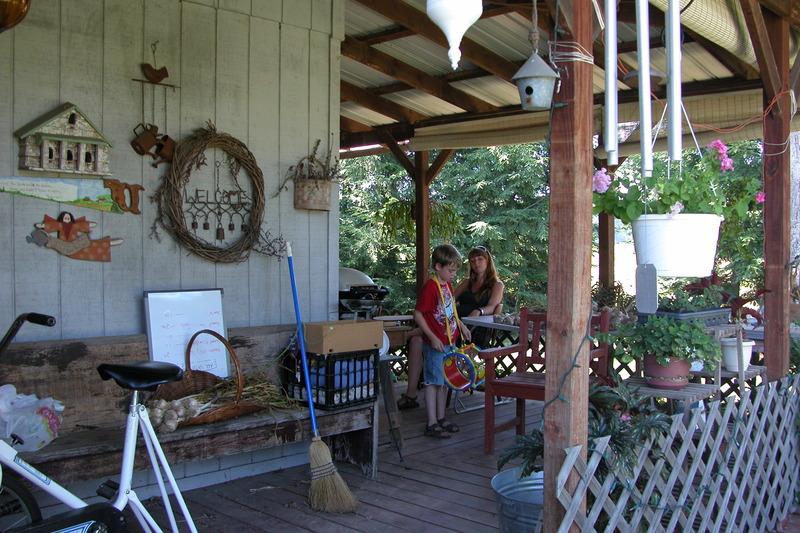 This entry was posted in Kate and tagged Farm, friends, summer, Visiting on July 14, 2011 by sweetridgesisters. One of the benefits of living in a densely populated city is that you can walk out your door and keep walking till you come to a fancy store, the kind that exists only as a catalogue that you curl up with near the woodstove in the middle of the winter when you are living on a far flung farm. Granted, it may take an hour to get to said store on foot, which is about what it takes to drive into a real town where I’m from, but unlike my middle sisters I am not a runner. I am a rambling walker, meandering along as I gaze upon the world around me. I love walking in the city for the same reasons I love walking in the country- there is always a new story, new vista, new adventure to see. A few days ago I bundled up the baby against the bitter chill of early spring, slung her in the sling, and headed out to peruse the wares at Anthropologie. 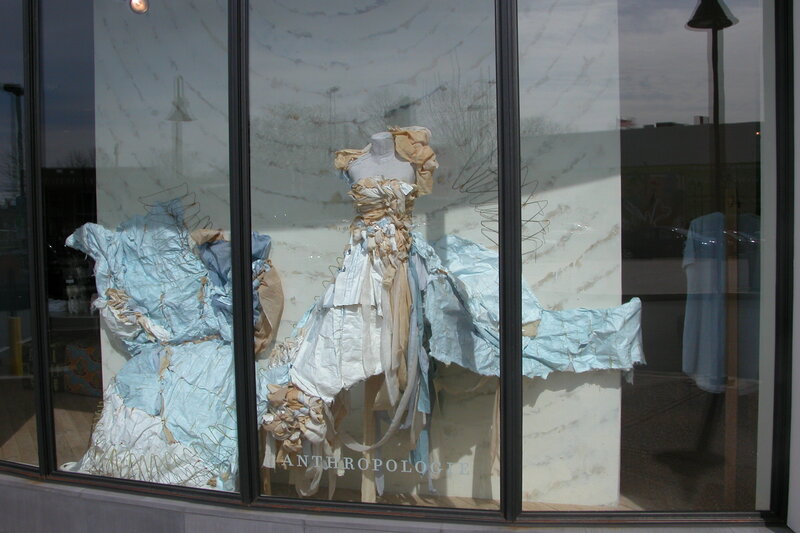 The dress in the front window display reminded me a great deal of the shipwreck dress that my incredibly talented friend Rebecca created for our North Carolina production of Twelfth Night. 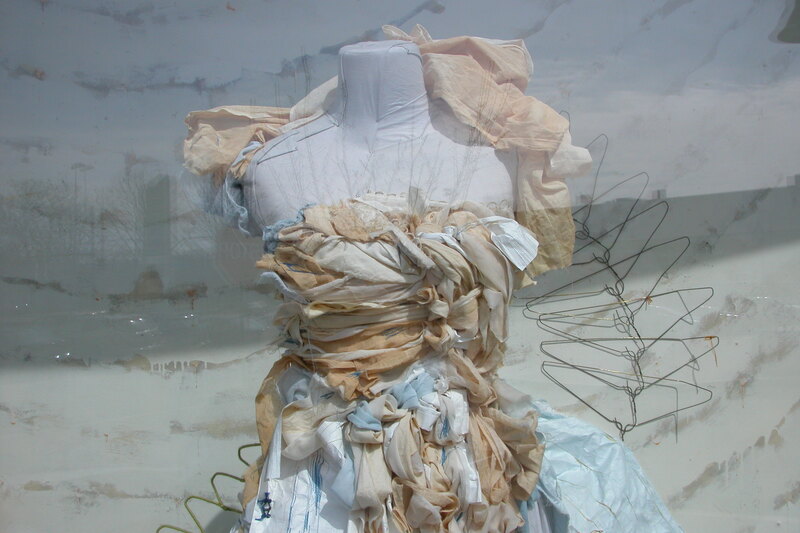 I am pretty sure that given lots of fabric and old hangars she could create a frock similar to this one. 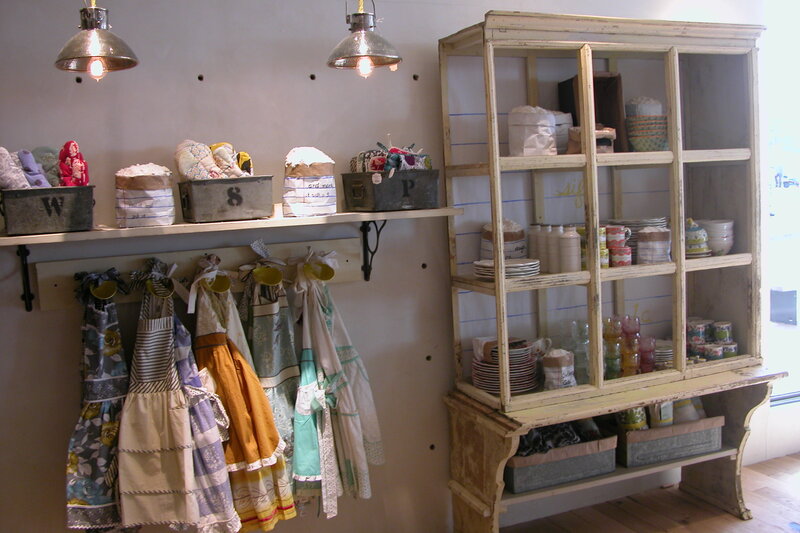 Anthropologie is a high end retail chain that started here in Pennsylvania back in 1992 and has expanded rapidly. The stores specialize in high class bright bohemian shabby chic elegant and inordinately expensive household items and women’s clothing. The store received a great deal of press a couple years ago when Michelle Obama ordered some of their furniture for the White House. Some decorators were in an uproar at the proletarian nature of this move, but the store is anything but cheap, though presumably more accessible than your average White House furniture dealer. Here is the bench that awaits customers in the entrance, inviting you to sit down at your peril and quite possibly snap it in two. Let’s take a closer look at that pricetag, shall we? 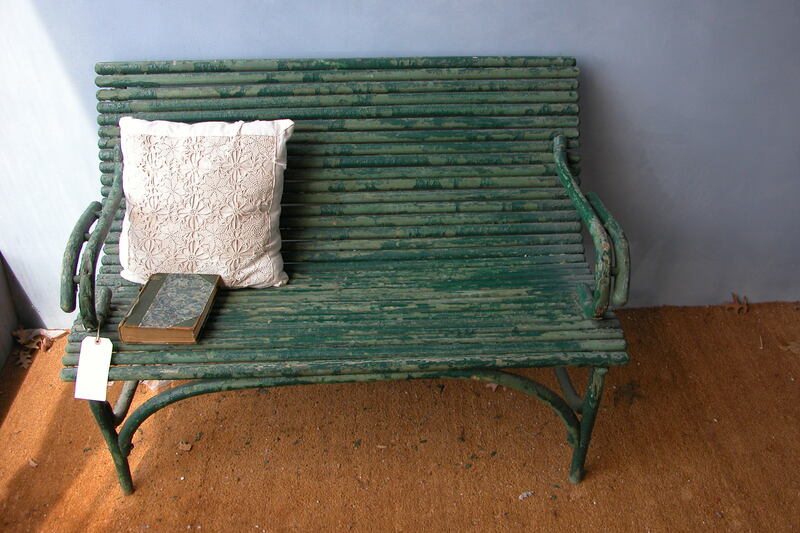 Why yes, it is a wooden painted bench from Belgium, circa 1900. Yes, it is $1,300 dollars. Hmmmmn. 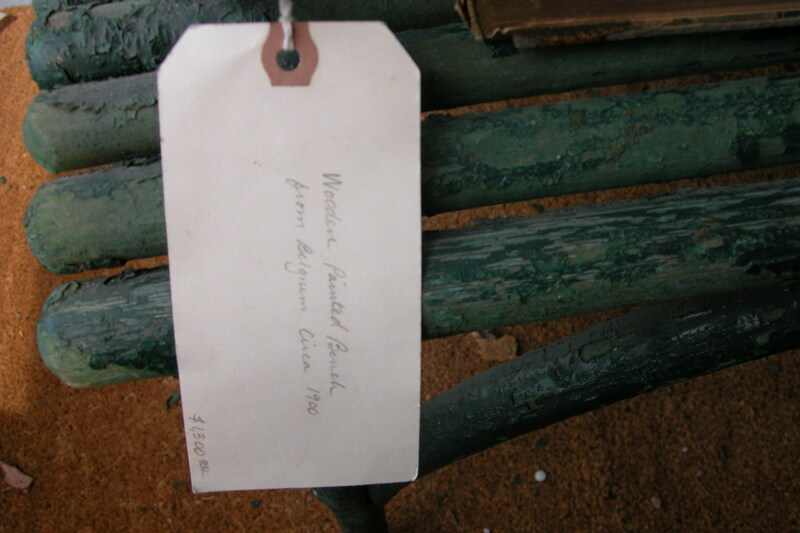 I have a peeling painted rocking chair from Pittsburgh, circa 1900ish, with very similar (and probably arsenic based) peeling paint on it. Casey threatens to throw it out the window on a regular basis. Perhaps I should see if this high end retailer will take it off my hands? It was at this point, pondering the bench, when I began to see the store through new eyes. 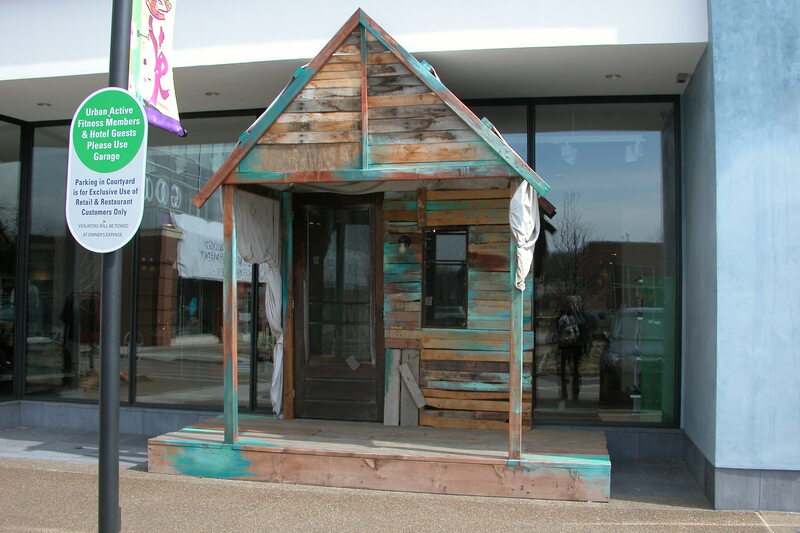 I stepped back outside to view the other window display, a ramshackle weathered grey green structure that looked like it had been designed and implemented by none other than my father. I kept the parking sign in lest you be led astray and think this was actually a scene from Sweet Ridge Farm. It does look eerily like something my father would build. It reminded me so much of home that from that point on, I made mental notes to have Clare photograph the flawlessly stylish high end anthropologie aspects lurking in plain sight back home at the farm. 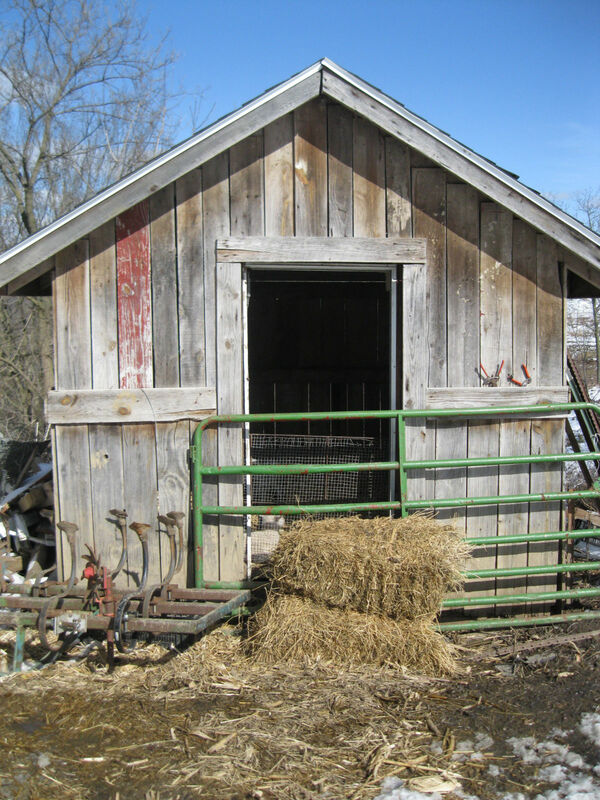 I think you will agree that the goat shed on the farm is significantly sleeker than the urban version. The sleekness is due entirely to the fact that my brother Robert, and not my father, built it. 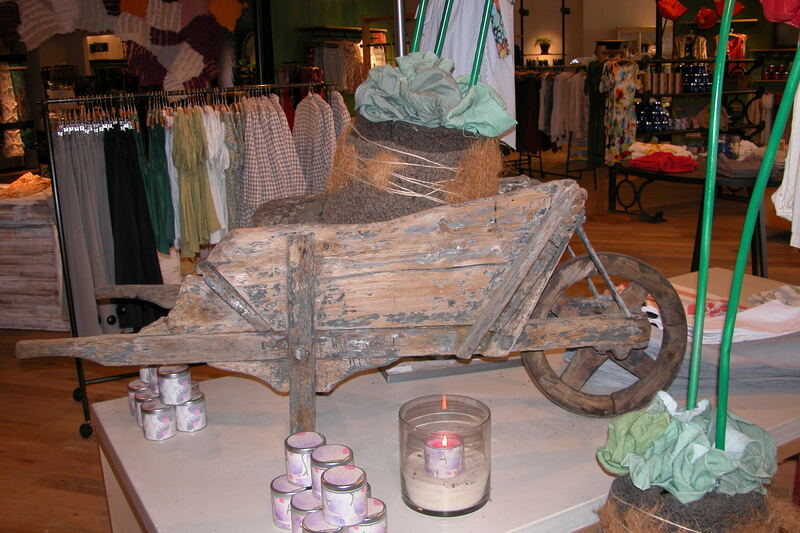 Moving inside the store, the rustic rural motif continued with a full sized wheelbarrow- unlabeled and not priced as far as I could see but it looked as though it may have experienced hauling work during the French Revolutioin. Of course Clare was able to locate a similar scene, minus the candles, out in the still snow covered fields. Note the artistic nature of the apple trees, which my father has brutally attacked with his spring fervor of pruning. There are few things harder on my parent’s marriage than my father and his love of excessive pruning. And here is the far less rickety version created by my farmwife mother. Well, it is less rickety now after Robert came and secured it into the wall. Having a son grow up to be a carpenter really allowed my mother to realize many of her dreams. It just took twenty five years or so. 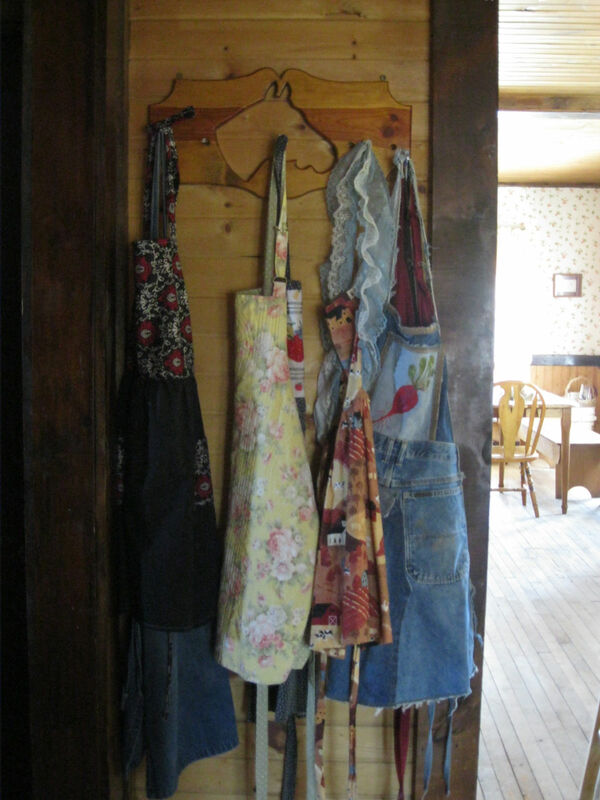 As for aprons, well, if you saw the post Mary and Colleen did on Sunday baking, you’ll know we’ve got that covered. 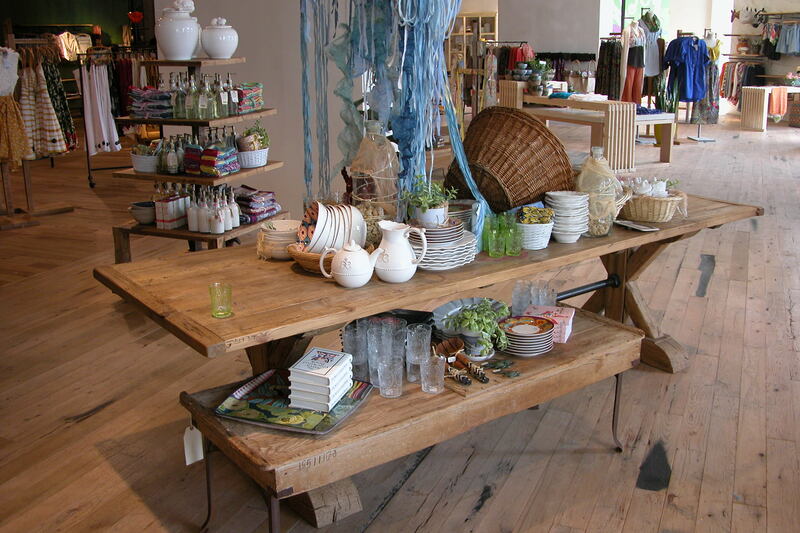 The folks at the store had a huge wooden table and bench. 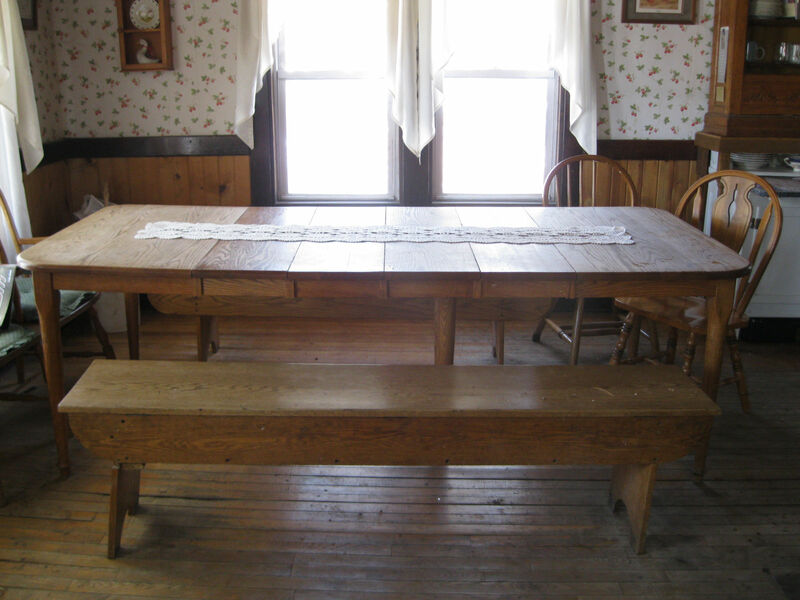 Which also looked strikingly familiar to our Amish built dining room table. 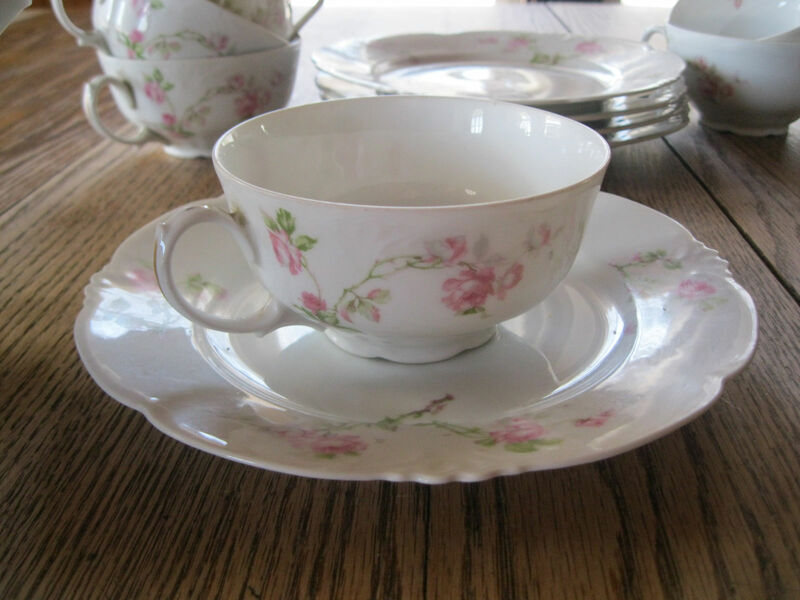 whereupon the resourceful photographer/stylist Clare brought out our Great Grandmother’s wedding china. 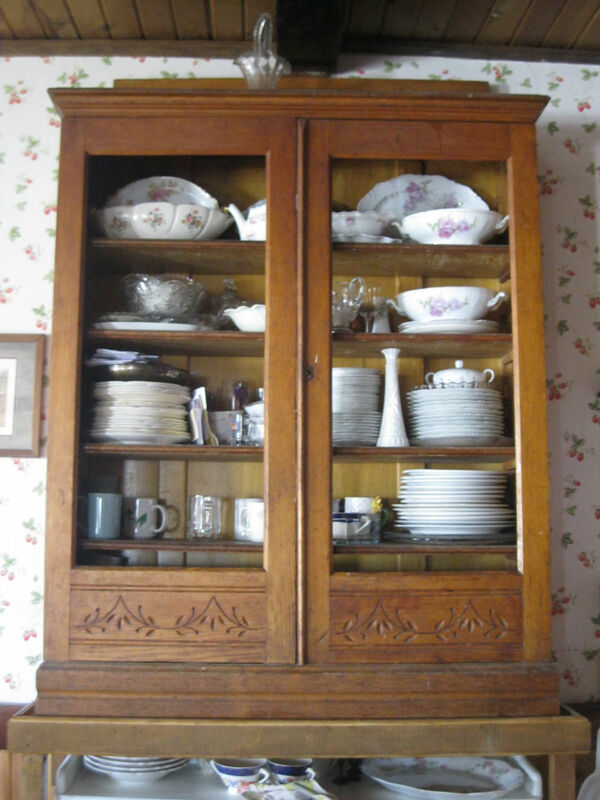 I loved wandering through the sophisticated big city store and viewing it through the prism of my Wisconsin ridgetop home, and to realize that you don’t need to pay two thousand dollars for a beat up cupboard from India in order to have beautiful style in your house. I’d go for the amish built table myself in a heartbeat. 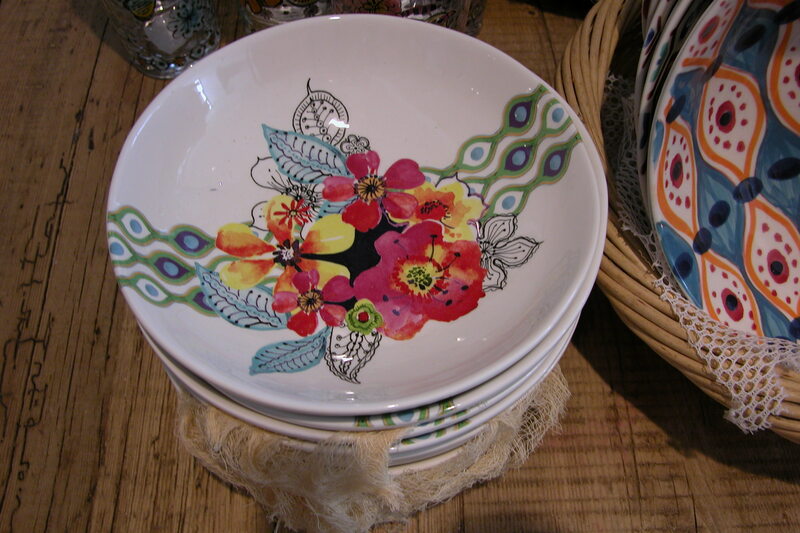 I found a great deal of inspiration in Anthropologie, which I think is a significant part of what they peddle- style and inspiration. I also have a newfound level of respect for my mother and her farmhouse decorating style. Who knows- perhaps she will be asked to consult in decorating the White House. I can see my father gleefully hoeing up the lawn to expand the White House garden, or perhaps volunteering to teach them a few lessons about pruning. 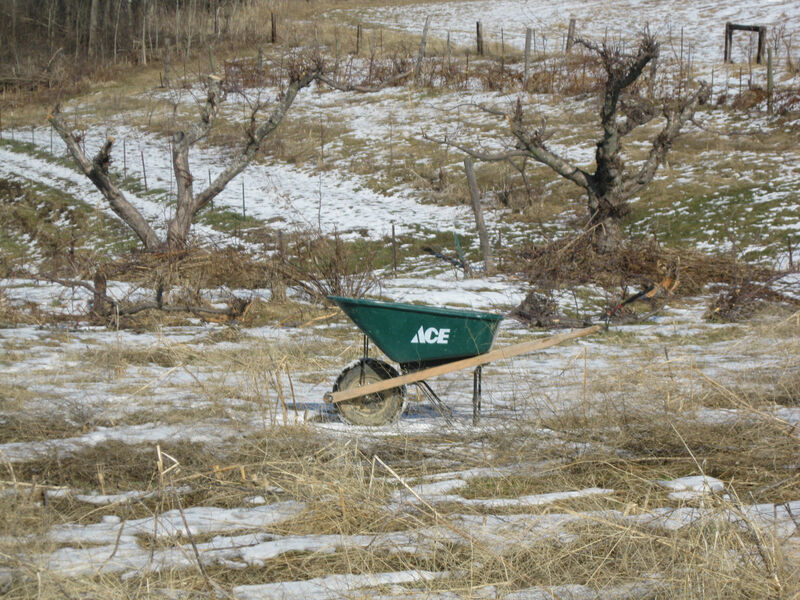 This entry was posted in Clare, Kate and tagged anthropologie, China, City, Farm, pruning, shopping, Walking, wheelbarrow on March 31, 2011 by sweetridgesisters.